Many people, when they hear the word ham, associate it directly with a whole leg, but why is it so? Cutting the ham, the right way is much more difficult than it looks and how you do it depends largely whether you will enjoy the ham the best way or not. 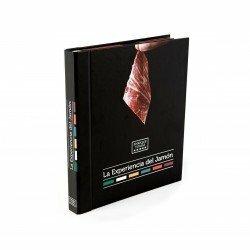 At Enrique Tomás, as lovers of the ham that we are, we are concerned that we all appreciate its quality and that is why we have prepared these slicing packs for you and your family, a way of enjoying ham with the exact thickness cut both by machine and by knife by the best ham carving experts. Why is it good to buy sliced ham? First of all, the sliced packs are very easy to keep because you don't even have to keep them in the fridge. These packs have to be stored in a dark, dry place with a temperature between 17 and 23 degrees, that is, you can store them in any pantry. Secondly, we have to take into account that our slices are cut both by machine and by knife by the best ham experts, so we make sure that each slice has just the thickness it touches, the perfect one to make sure that it will be fat enough for you to notice its flavour and fine enough to melt all its oil in a cascade in your mouth. Finally, it should be noted that a whole ham must be consumed before 16 days in summer and before 21 days in winter, which means that in a household with only a few members, it must be eaten quickly and cannot be eaten gradually. If you want to enjoy the ham without having to eat a little every day you can do two things, either invite your friends to lunch or dinner and enjoy the cured ham all together, or bring it to us Enrique Tomás, regardless of whether you have bought the ham leg in our stores or not, and we will slice it for you. Our packages are usually of 80 grams but there is the possibility to make them bigger, we adapt to you completely! Once you bring us your leg, you will get your vacuumed packs with ham slices as well as the ham cubes and shavings. As we like to say in Enrique Tomás, everything of a pig is good even, so let’s leave it totally clean!